A LIFETIME OF LUXURY FOR A FRACTION OF THE COST! Shared Ownership schemes are not new, they have been around for many years associated with the purchase of the ultimate in luxury - Private Yachts and Jet Planes – but what about luxury property? Sunset Estates are now proud to offer you this unique opportunity to own a 3 bed villa on El Valle, the most exclusive of all the Polaris Golf Resorts. Only 688 homes will to be built within a closed perimeter on 1,100,000m2 on El Valle Golf Resort, creating an abundance of wide open space. All luxury villas and penthouse-style apartments will be built with different characteristics and will be centred around a Championship 18 hole golf course designed by Nicklaus Design. 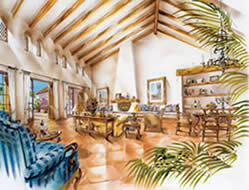 In El Valle Town Centre you will find all day to day amenities required within an authentic town setting. Choose great restaurants, an afternoon shopping spree or bathe in a heated pool these are just a few of the possibilities open to you. In addition there will also be a 5 Star Deluxe Hotel with 150 rooms. In the El Valle Golf Resort Town Centre you will find endless services to make you feel privileged together with the peace of mind 24 hour security and CCTV gives you. » All prices are inclusive of all Legal Fees and Taxes – and include a Golf Buggy!